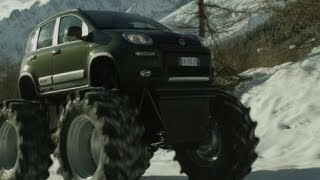 Who would have imagined to see the compact car like Fiat Panda as a monster truck? Well, Fiat has unveiled this Monster truck version which combines a Panda 4x4 to the floor of a Jeep CJ7 4200 and is equiped with wheels with tractor tires "High Speed" with a diameter of 150 cm (59 inches) and width of 50 cm (19 inches). 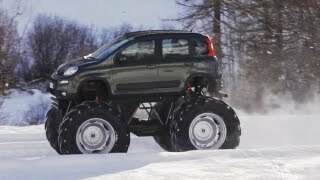 Fully functional, the Fiat Panda Monster Truck will lead the next spot on air early 2013. Made by the agency Leo Burnett, the advertising film tells the story of four friends who set off on a weekend in the mountains. The Panda 4x4, becoming Monster Truck, salt lightly to the refuge, wonderful for all its capabilities.